Up to the moment of launch, the entire weight of the space vehicle had been resting on four hold-down arms mounted around the edge of a 14-metre hole in the launch platform through which the engines could belch their fire. These arms included strong pincers with mechanical linkages that firmly held the base of the first stage to the platform. When the computers controlling the launch had decided that all the engines were up to full thrust, the four hold-down arms were opened by their linkages being pneumatically collapsed. Simultaneously, three small masts that had been supplying fuel and other services to the bottom of the S-IC disconnected and swung upwards. Protective hoods fell over both the arms and masts before the vehicle rose and the full blast of the F-1 exhaust hit them. The release of the Saturn V was not instantaneous: it was once described as more of an ooze-off rather than lift-off. This was in part due to a number of tapered pins mounted to the launch platform, which were pulled through dies affixed to the bottom of the SIC. Their deformation controlled the acceleration of the rocket for the first 15 centimetres of ascent. As soon as the immensely heavy vehicle began to rise, it could not safely return to the pad, so for the first 30 seconds of flight, intentional shutdown of the engines was explicitly inhibited. 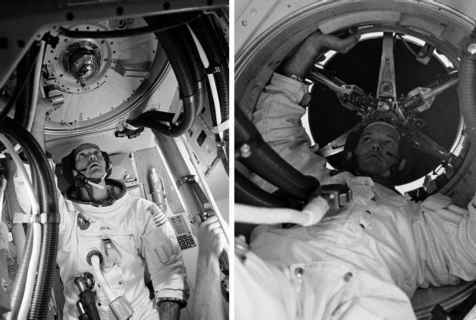 Reacting to this change in circumstances, five access arms that had continued to service the vehicle up to the moment of launch had to swing clear immediately, their motion triggered by the first 2 centimetres of travel. As part of that action, all the umbilicals connected to the vehicle had to drop away, their disconnection serving as the starting point for the first of seven timebases that orchestrated the control of the Saturn V. Timebase 1 would operate through most of the first-stage burn. 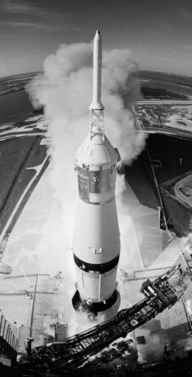 As 3,000 tonnes of metal and volatile propellant rose past the umbilical tower, it could be seen to lean disconcertingly away as though it were about to go out of control. This was an entirely planned yaw rotation designed to manoeuvre the rocket away from the launch tower as a precaution in case a swing arm were to fail to retract or a gust of wind were to push the vehicle back towards the unyielding tower. Apollo 15 begins its ascent from Pad 39A as the swing arms retract. Apollo 11, eight seconds into its flight. It took about 10 seconds for the entire length of the space vehicle to clear the tower, and responsibility for the mission then passed from the Launch Control Center in Florida to the Mission Operations Control Room (MOCR) on the outskirts of Houston, Texas. Twenty seconds after lift-off, the four outboard engines canted away from the centreline so that if one of them were to fail, the others would be directing their thrust nearer to the vehicle's centre of gravity, improving the chances of the instrument unit continuing to steer the rocket successfully. 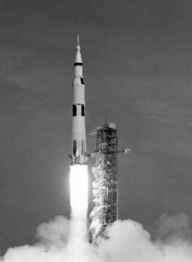 The first two minutes of the Saturn V's flight was a spectacular affair attracting many hundreds of thousands of sightseers to the roads and beaches around Kennedy Space Center to witness each launch. Over a million people are believed to have gathered for the launch of Apollo 11. At the launch of Apollo 4, the first time the Saturn V had flown, TV presenter Walter Cronkite was bemused to find pieces of the ceiling coming down around him as the roar from the five F-1s shook the temporary CBS studio from 5 kilometres away as millions of viewers looked on. Until then, few had appreciated the intensity of sound from five of these engines in free air. Once the sound finally reached them, people described how they didn't so much hear the rocket as feel it. The slow rate of this leviathan's majestic rise only served to lengthen its assault on the body.